Playpower is creating new software for a $10 computer that already exists and is being sold in street markets around the world. 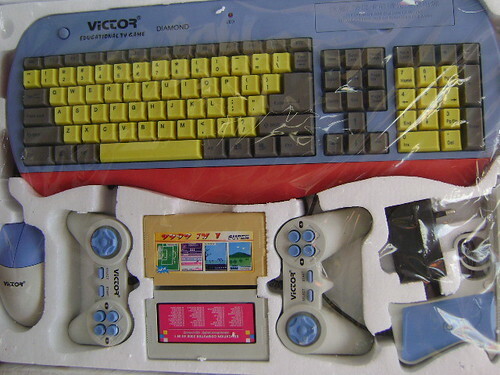 These computers are typically packaged with a full keyboard, mouse, game controllers, and a cartridge filled with software like typing games and BASIC programming. The computer is located inside the keyboard, which connects directly to a family's television as a screen. The computer is based on the 8-bit 6502 chip, which was used in the famous Apple IIe computer and the Nintendo Entertainment System (NES). In fact, the computers are technically a clone of the Nintendo Famicom, which is why they are referred to as "FamiClones". This computer hardware is now in the public domain, due to expired patents. As a result, millions of these devices are being produced every year by dozens of manufacturers, under a variety of brand names. You can even obtain them in the USA through Makershed.com. In countries like India and Ghana, skills as simple as learning to type can mean the difference between earning $1/day as a menial laborer and $1/hour in a back-office. We want to faciliate these kinds of economic transformations through affordable, effective and fun learning games. By freely providing our source code directly to the FamiClone manufacturers, Playpower hopes to leverage their global distribution network to introduce quality educational software to millions of children around the world. By organizing and translating development materials, and through the creation of new development tools, we're trying to make it easier for diverse groups of people to create new games and educational software for "the world's most affordable home computer." We believe that 8-bit computers, simple as they are, can be very effective at introducing computing cultures to children in emerging economies because of their low-cost and wide distribution. After all, 8-bit computers were highly effective at introducing generations of Americans and Japanese to games and programming! Because these devices enable their users to learn programming in BASIC, these computers could provide a powerful experience that could act as a stepping stone to far more advanced computer use. Playpower is all about content: open-source educational content for low-cost computer platforms. In the future we may focus on multiple low-cost computers, but right now we are focused on creating content for the 8-bit famiclones. We are not trying to design a new computer. We're trying to maximize the educational value of what's already available in the market.